In early September, I visited Spoga Trade Fair in Cologne, Germany. Spoga claims to be the largest garden fair in the world, but they also have a large BBQ section. I was interested in more than 300 BBQ exhibitors spread in two halls and two outdoor areas. More specifically, I was interested in meeting with Monolith Grill people. As a Monolith kamado user, I was keen to engage and make new friends. Monolith Grills had two booths. One indoors and one outdoors. Needless to say, the outdoors booth was all about live cooking. I started indoors on the first exhibition day and Monolith Grills team was already super busy with customers. Friendly gentleman greeted me and walked through product basics, which however, I already knew quite well. He also took me to the outdoors area where the team was heating up grills. Food was not ready yet, so I settled for enjoying the atmosphere. 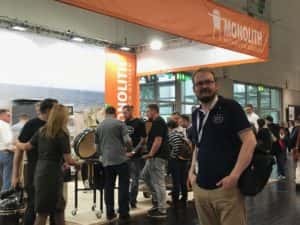 Later I got a chance to sit down with Elena Schöley, Vice Managing Director of Monolith Grills. Elena was kind enough to share her ideas on brand building and how Monolith stands out in competition. After a nice chat, Elena introduced me to Monolith Grills Managing Director, Mr. Matthias Otto. With great energy, he introduced me new products and features but also philosophy behind Monolith. 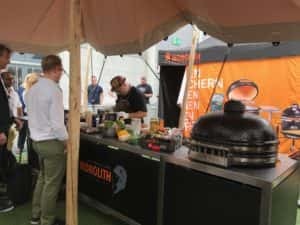 Monolith Grills position themselves into premium class in kamado grill scene. I can confirm premium quality. I have been using my Monolith six months already. Quality is excellent. However, as competition increases, it becomes harder and harder to differentiate by quality only. There are other premium class brands available and quality is most often good enough. You can also try to differentiate by features. Then again, all premium class kamados are already quite feature rich. Therefore, brand is important, and people build brand. I am a believer already, so I do not need to be convinced. However, meeting with Monolith people and sharing few laughs with them, built sense of belonging. Feeling as a member of the team, makes grilling now much more fun. There are faces and names behind the product. Monolith Grills build their brand in social media. People and stories are in spotlight. Social media posts have always people present and most often a story also. People are travelling somewhere, cooking together and experiencing something together. The actual product is important, but it is not a star of the show. People are. Meeting with people behind the brand can happen in many ways. Social media is easy for the most of us. It is online. Face to face meeting however, is more difficult. I decided to make the effort and I do not regret. I am now part of a small story and it feels great. Grilling is not about food only. It is about people! Elena Schöley, Vice Managing Director of Monolith Grills at Spoga Trade Fair. September 2nd of 2018.